At last I finished my first non-chick-lit book since I had baby girl. It is so nice to have the energy to read something that is beyond an US Weekly reading level, not that there is anything wrong with an US Weekly. I enjoyed reading March. It was written beautifully. The author has the ability to write intelligently without coming across as pretentious in her use of words. The main character, however, was not particularly likable. I think Louise May Alcott had a strong, courageous man in mind as Marme's husband, rather than a weak, pious man that the author describes. Now that I am on a roll, I can't stop. 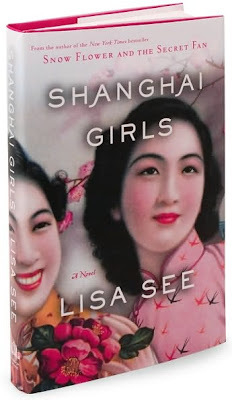 I am already hooked onto my next novel called Shanghai Girls. It begins preWW II and right now the Japanese have just invaded China and committed barbaric crimes. It discusses feet binding in China which is such a strange, interesting phenomenon. If you google this topic you would be appalled at the photos you find and what these women were subjected to in order to appear attractive with tiny feet. Suffering for beauty is a concept familiar to most women, who have dyed, plucked or shaved their hair, squeezed their feet into uncomfortable high heels or even surgically enhanced parts of their anatomy. Millions of Chinese women went even further — binding their feet to turn them into the prized "three-inch golden lotuses." 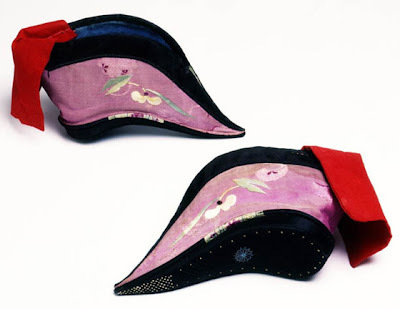 Footbinding was first banned in 1912, but some continued binding their feet in secret. Some of the last survivors of this barbaric practice are still living in Liuyicun, a village in Southern China's Yunnan province. I regret binding my feet," Zhou says. "I can't dance, I can't move properly. I regret it a lot. But at the time, if you didn't bind your feet, no one would marry you." "The bandages that women used for footbinding were about 10 feet long, so it was difficult for them to wash their feet," Yang says. "They only washed once every two weeks, so it was very, very stinky. But when I was young I was very free, because when I was naughty my mother couldn't run fast enough with her bound feet to catch me and beat me." Since you are reading Shanghai Girls, I would also recommend Memoirs of a Geisha. It is a little difficult to read at time, but still very well done (not to mention culturally enriching). I would definitely categorize it as "non-chick-lit"! I remember being scarred by reading The Good Earth in high school because of the foot binding. Yikes. If you click onto that site, you will really be scarred! And to think that the Chinese practiced foot binding for hundreds of years is astounding! You need to join goodreads, you are such a great reader and I need some fresh ideas.